A Mass of Christian Burial is scheduled for 10 a.m. Monday, July 3, at St. Anthony’s Catholic Church for Marie Elizabeth Scott of Artesia. Scott, 86, passed away Friday, June 30, 2017, in Artesia. Fr. Francis Lazer will officiate at the services, with interment to follow at Woodbine Cemetery. Pallbearers will be grandsons Jud Hightower, Johnny Craft, Christopher Scott, David Scott, Taylor Scott and Rusty Arp. Visitation will be held from 2-4 p.m. today at Terpening & Son Mortuary. A rosary will be recited at 6:30 p.m. today at St. Anthony’s. Marie was born March 7, 1931, in Bronx, N.Y., the daughter of James and Frances (Lanci) Carlo. On Feb. 12, 1950, she married Orville Dane Scott in New York City, and the couple came to Artesia in April 1950 from New York. Marie was a bookkeeper for Guy Chevrolet for many years. She was a member of St. Anthony’s Catholic Church, an avid bingo and slot machine player, and loved to cook, sew and crochet. 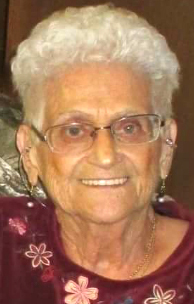 Her favorite thing was watching her grandchildren play sports, and she followed them wherever they played. Survivors include daughters Deborah Craft and husband John of Artesia, and Karen Hightower and husband Joe of Amarillo, Texas; sons Ky Scott and wife Karen, and Danny Scott and wife Ginger, both of Artesia; grandchildren Jud Hightower and wife Dayna, Johnny Craft and wife Krystal, Lanci Arp and husband Rusty, Christopher Scott and wife Valerie, Anessa Golden and husband Casey, David Scott, and Taylor Scott; and great-grandchildren Trey Craft, Lexy Hightower, Jake Craft, Braxon Hightower, Gage Arp, Caden Golden, Dane Arp, Crayton Scott, Mason Golden, Ashton Craft, Vicente Scott, Owen Golden, and Kyla Johnston. She was preceded in death by her husband, Orville Dane Scott, on June 30, 2006; her parents; and brothers Anthony and Danny Carlo. The family wishes to give special thanks to the San Pedro Nursing and Rehabilitation Center staff for all of their kindness and support.